The factorial of a number n is defined by the product of all the digits from 1 to n (including 1 and n). It is denoted by n! and is calculated only for positive integers. Factorial of 0 is always 1. The simplest way to find the factorial of a number is by using a loop. Take the descending positive integers. Factorial of 4 using for loop is shown below. 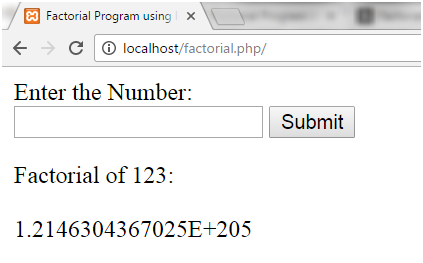 Below program shows a form through which you can calculate factorial of any number. Factorial of 6 using recursion method is shown.